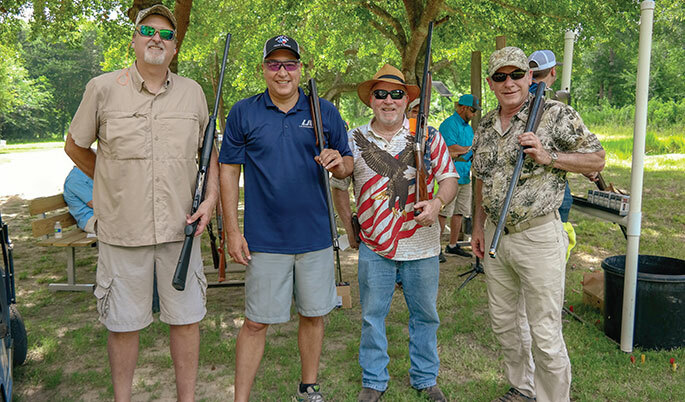 The Underground Construction Technology Association Gulf Coast Chapter held its annual Sporting Clays Event on June 8 at the Westside Sporting Grounds in Katy, Texas (Houston area). Proceeds are earmarked for the organization’s Scholarship Fund. With 124 participants and multiple sponsors, the event was a huge success, netting more than $6,000 for student scholarships. The winning team was from Insituform/Aegion. Team members were Timothy Naylor, Jeff Cannon, Andy Ozment and Glen Crawford. Joey Fick with Sandale Utility Products won the individual shooter title. participating, but raffling off two spots on its team, captained by Carol Haddock, public works director, and donating the proceeds directly to the UCTA Scholarship Fund. “All proceeds go to UCTA’s primary goal; education. The scholarships we offer to children of our chapter’s members can make an enormous difference to a family and we are proud that we have the support of everyone that participated to make it possible. The event sponsors have to be given credit – their support makes this event possible,” Ellett added. Organizers have already picked the date for the next UCTA-Gulf Coast Sporting Clays event. It will be held, rain or shine, on Thursday, May 2, 2019.